Think back to Verizon’s plan to purchase Yahoo and the recent confirmation of Googles’ plan for splitting it’s search index into 2 parts. Now there’s talk of AT&T acquiring Time-Warner. Mega mergers between delivery platforms and content generators are all about ad dollars and viewership.From an advertising point of view this puts the big media companies in front of audiences that live on mobile devices. AT&T as the delivery platform and Time-Warner as the content creator, provider and distributor. And even if the AT&T/ Time Warner deal falls apart, expect to see long term partnerships between those companies looking to increase their mobile exposure. This revenue growth for advertising revenue in the mobile space is growing exponentially. And for media companies that traditionally grew their fortunes in a ‘cable connected world’ will want to compete in the same sandbox where Facebook and Google play. 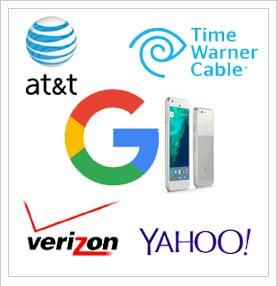 Verizon continues to shop for online properties such as ‘YAHOO!’ Verizon joins with Google Pixel; Googles’ new powerhouse mobile phone. Google splits it’s Search Index into 2 parts ,One for mobile and other desktop searches. It’s not everyday we get a warning about an impending search engine tsunami over mobile! Think about how you want your business, your website to be found over mobile search and then execute a plan fast.